Great news: bad credit car loans in Nova Scotia are now easy to apply for and easy to get, thanks to our car loan service. The streamlined application process we offer and the huge network of lenders and dealers we’ve made available takes the hassle out of vehicle financing. Our loans start at $5,000 and go up to $40,000. Can I get a car loan if I have bad credit or went bankrupt? Yes. Our network of lenders and dealers specializes in bad credit financing. If you have bad credit or no credit, we’ll still match you with a nearby dealership and help you get approved for a loan. How much tax do I need to pay on a car purchased in Nova Scotia? Currently, the sales tax (HST) on vehicles in Nova Scotia is 15%. Nova Scotians pay one of the highest sales taxes in the country. How is the interest rate on my car loan calculated? That’s decided by the dealership offering you the loan. Usually, your rate is based on a number of different factors, like your credit, income, employment history, and loan amount. It depends on your household finances and vehicle budget. With a short car loan, your monthly payments are larger, so you can pay off your loan faster and save money on interest. Some borrowers don’t have the cash flow to handle those big monthly payments, however. Meanwhile, longer car loans give you more time to pay off your principal balance, which makes for smaller payments that are easier to budget for. Unfortunately, you’ll also end up paying more interest. 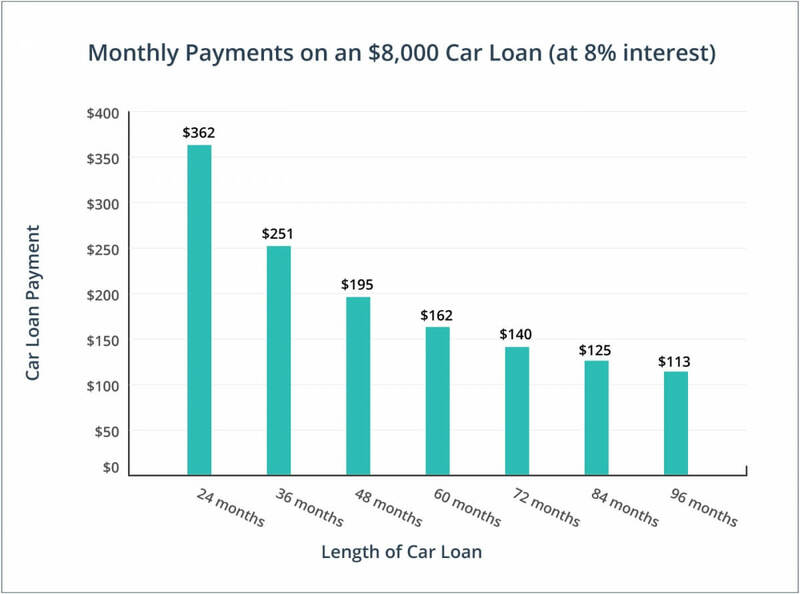 Check out our graph below to see what your monthly payments might look like over different lengths of time on an $8,000 car loan at 8% interest. Secure your car loan before you start shopping for a vehicle. Then you’ll have a better idea about which cars you can realistically afford. You’ll also be able to negotiate strictly on price once the terms of your loan are set. Before you sign on the dotted line, carefully consider the interest rate the dealer is offering and how long your loan term is. Remember: you pay more interest on a longer car loan, and your car depreciates in value as the years go by. Is the vehicle’s engine bay clean and rust-free? How do the belts, hoses, and wires look? Look for signs of cracking or wear. Checking under the hood is one of the best and quickest ways to determine if a car is mechanically sound. Always take a car for a test drive before you purchase it. Drive the vehicle at different speeds and on a variety of roads and check the headlights, signal indicators, and windshield wipers to make sure they work. You have 1 month to return your used car and get a full refund. False. There’s no return policy on used car purchases in Nova Scotia. The sale is final, which means you need to thoroughly test drive and inspect any vehicle you’re considering buying. You don’t pay sales tax if you buy a car privately in Nova Scotia. False. While you won’t pay the harmonized sales tax (HST), private sales are subject to Nova Scotia sales tax (NSST). The NSST is 15%. Nova Scotia used car sales are regulated by a powerful organization similar to the Ontario Motor Vehicle Industry Council. False. Unfortunately, Nova Scotia used car buyers do not enjoy many of the protections taken for granted in a jurisdiction like Ontario. Nova Scotia does not have a strong auto sales regulator, which means dealers are not bound by a code of conduct or mandatory disclosure rules. Nova Scotians are buying more cars this year. New vehicle sales increased 2.2% from April 2015 to April 2016. Nova Scotia allows family members to ‘gift’ vehicles without paying sales tax. The family member designation is quite generous and includes common-law partners, in-laws, siblings, grandchildren, and stepchildren. Nova Scotians seem to prefer domestic vehicles. According to Statistics Canada, domestic vehicles outsell overseas-made vehicles in the province by a margin of almost 3 to 1. Nova Scotia has one of the least regulated used car markets in Canada. That makes it all the more necessary to thoroughly inspect a vehicle before buying, whether it’s from a dealership or a private seller.